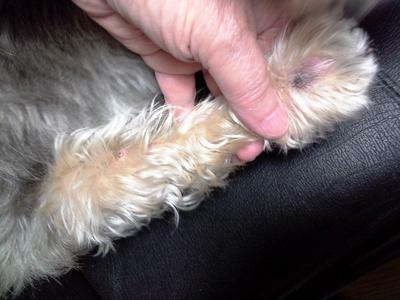 Can you tell me what this growth is on my dog's foot? He has been licking it. My dog is 9 years old, a Chorkie, a bit overweight and is on a diet now for 2 weeks as the Vet said there is a 10 lb puppy inside waiting to get out. My dog is a male, neutered. His mom was a large chihuahua and his dad a 7 lb. Yorkie. His sisters and brothers, except for the runt of the litter, all weigh approx. 12-13 lbs. He weighs about 19 lbs. I just noticed this growth today. He has had surgery in the last 6 months to remove another growth on his body. This one just popped up...but now that I think about it, he has been licking it. He has allergies, and we live in a rental with carpeting, so I cannot change out the carpeting. This measures approx 1" long and is approx. 1/4" in height. It is soft and squishy, but the dark color concerns me. Not on any medications other than Revolution which he has been on since birth as we lived in GA. We now live in OH, so he is not on it 12 months out of the year. I am concerned about the mass that you found on your Chorkie’s foot. 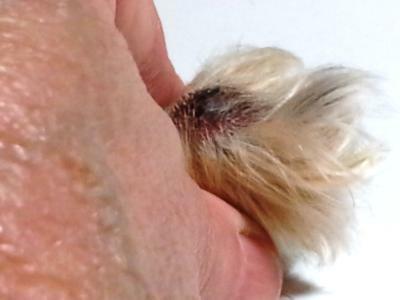 It could be any of a number of things, but its appearance and location fit with the possibility of it being a dangerous type of tumor called a melanoma. Make an appointment with your veterinarian as soon as possible. He or she will probably want to take a sample of cells from the mass using a needle and examine it under the microscope. 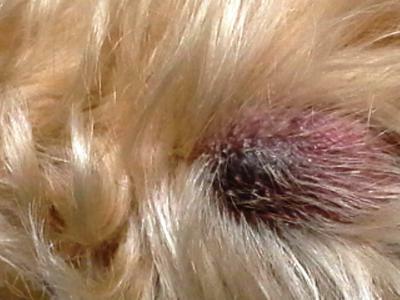 If the mass can’t be diagnosed with this simple and inexpensive test, your veterinarian may need to surgically remove some or all of it and send a tissue sample to the pathologist for identification. I am so sorry about your chorkie boy. grieving with you. I have since this posting, found out my chorkie has Lymphoma...you were correct. Thank you. Of course, I am devastated.